Finding photographs of folk- and fairy-tale author Ruth Manning-Sanders has been a long, rarely successful journey. The first photo I discovered, sometime in 2010, was a grainy image from the 1972 reference work Third Book of Junior Authors. I've found a handful of others over the years, including an excellent portrait shot. A roundup of those efforts can be seen here. But it's still like finding a needle in a haystack; if there isn't a family member out there holding onto a secret stash, then it might be that very little else will turn up in the future. 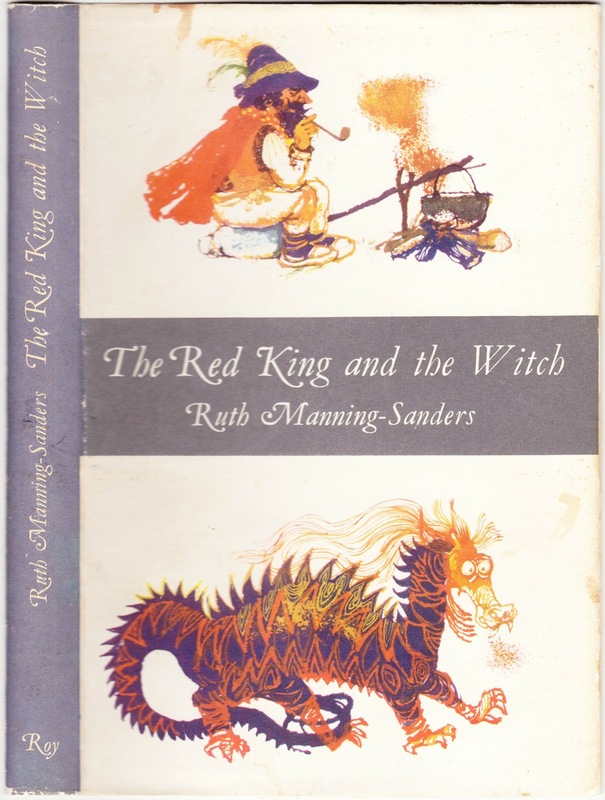 So I was thrilled when I discovered the above photograph printed on the dust jacket of Manning-Sanders' 1964 hardcover The Red King and the Witch (a collection of retold gypsy folk tales). 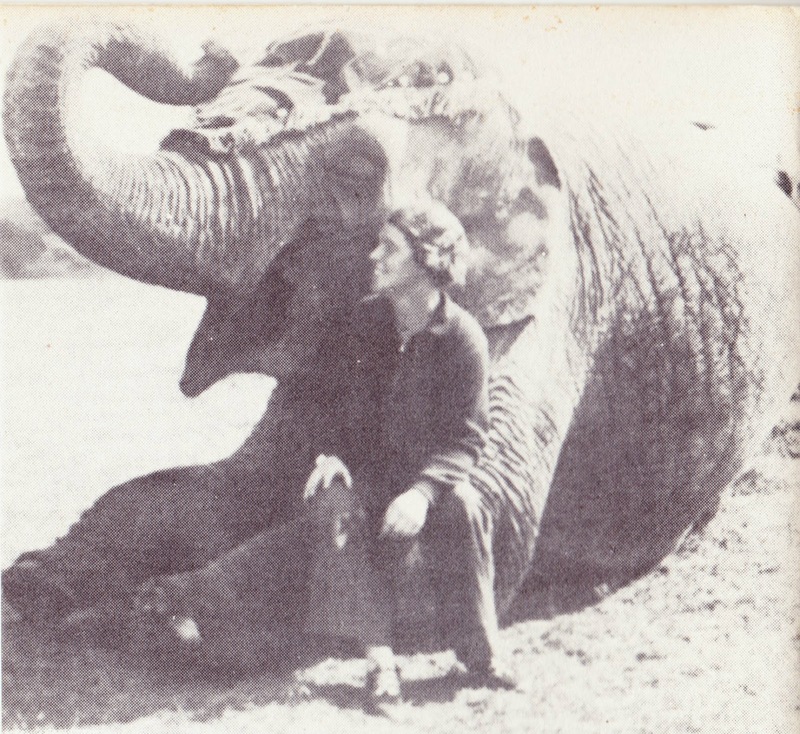 The nearly three-inch-wide black-and-white photo shows Manning-Sanders sitting on the front leg of a circus elephant. This is actually the original photograph that was modified (it received an "elephant-ectomy") and used for that grainy portrait that appears in Third Book of Junior Authors. So, while this is a better and much more complete photograph featuring Manning-Sanders, it's not new, per se. 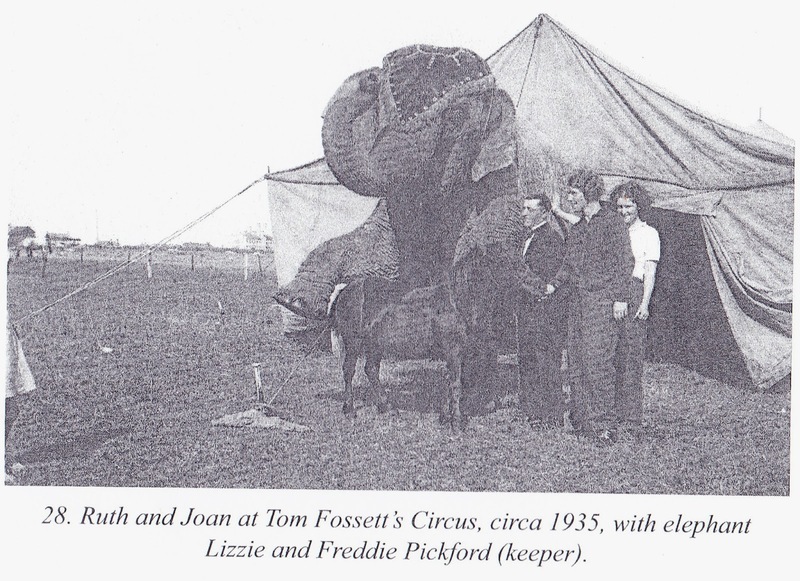 So that would mean The Red King and the Witch dust jacket photo is circa 1935, was taken at Tom Fossett's Circus, and features Lizzie the elephant. 1. Manning-Sanders biographical information from dust jacket: "Mrs. Sanders, whose life has been far from dull, describes her childhood as 'extraordinarily happy ... with kind and understanding parents and any amount of freedom.' With her two sisters, she spent long summer holidays swimming, boating, climbing hills and '(running) ... wild generally.' At home in Swansea, they had 'literally thousands of books' and Mrs. Manning-Sanders read — as Dylan Thomas so aptly put it — 'everything and all the time with my eyes hanging out.' She later became a Shakespeare scholar, married a Cornish artist and began marital life in a horse-drawn caravan, travelling all over the British Isles. When circus life caught her fancy, she promptly went about actively participating in Rosaires' Circus — even entering the lions' cages. Today, a widow, she lives in Bristol with her daughter and two grandsons, making use of the life of action and excitement by communicating that verve in the books she writes for young readers." This is one of the few overt biographical mentions I've found regarding the death of her husband, George Manning-Sanders, in 1953. And, while there is a mention of her daughter, Joan, and grandsons (Christopher and John Floyd), there is notably no mention of her son, David. I know that David, born around 1915, served as an Acting Major for the Royal Engineers during World War II, but I've never found any confirmation of his fate beyond that. The lack of references to him after the war might, sadly, tell us all we need to know. All the stories in this book were told by gypsies. A few of them (Brian and the Fox and The Little Bull-Calf, for example), were told in English. But most of the stories were told by the gypsies in their own language, which is Romani, and were taken down and translated by scholars. The stories came from many different countries; for the gypsies, who are believed to have lived originally in India, have wandered all over the world. And, as they wandered, they picked up more stories from whatever country they happened to be in, as well as repeating to the people of that country the stories they had brought with them. Through the years, as they were told and retold, the stories became altered, sometimes not very much, sometimes greatly. It all depended on the particular fancies of the narrator: an ogre might become a dragon, a prince might be put in the place of a princess, or a poor boy in the place of a poor girl; but the idea at the back of the story would remain. For instance, you all know the story of Cinderella, but you may not know The Tale of a Foolish Brother and of a Wonderful Bush, which is just a Polish gypsy's version of the same idea. T'a doi jivena kano misto. What a wonderful way to start a book ... All the stories in this book were told by gypsies.